How can Social Media cut through the cacophony of noise and deliver great content while fostering relationships? 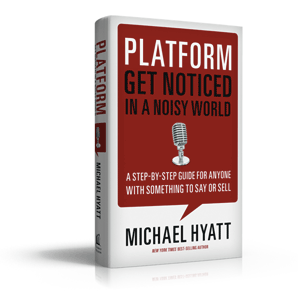 Michael Hyatt does not disappoint. The chairman and former CEO of Thomas Nelson publishers has written a step-by-step guide for building your platform. Much of the content derives from posts at his excellent blog, but the book is worth every penny. Social media is relational, not transactional. Building a platform is not about spamming potential hearers or buyers, but about creating relationships and adding value to people's lives. 1) Start with Wow - creating a compelling product is crucial. David Ogilvy wrote, "Good marketing only makes a bad product fail faster." While I'd enjoy blogging about my beloved Oregon Ducks and the latest variations of goo and gee coming from our son, Ezra (also beloved), that's not what I'm hoping to contribute with Believing-Thomas. My hope is that I can become a fruitful participant in the passionate conversations well underway about theology, culture, and the future of the church. 2) Prepare to Launch - Hyatt encourages us to think big and have specific goals, but be able to boil our goals down to an elevator pitch. There is plenty else on assembling your 'pit crew', branding, and developing a media kit. What's my elevator pitch for Believing-Thomas? "Believing-Thomas is an online conversation that traces the marks of Christ and culture, looking for clues about the activity of God in our world and for hints about how the church might better serve a changing reality." 3) Build your Home Base - This is basically the how-to-build-a-blog section. Hyatt offers many words of wisdom to make blog writing an efficient and fruitful process, while avoiding common blogging mistakes. Personally, I use and LOVE Evernote to organize my ideas and notes for everything, blog or otherwise. Evernote is basically my digital-brain and has become my primary productivity tool. 4) Expand your Reach - Hyatt considers your blog/website to be your home base and uses this section to teach us how to employ Twitter, Facebook and other social media to expand the reach of your home base. How to generate blog traffic and subscribers without losing too many readers. I'm trying to promote this blog along existing networks of friends without getting spammy. One change I've made in response to this section is to re-envision my church's Facebook Page and Twitter feed. I used to only post announcements and reminders, along with the occasional picture album from recent events. Now I use Buffer to collect and stagger posts of interesting links and stories from the web that I hope will give food for thought to our audience. Again, the hope is to maintain a regular online presence where self-promotion is but one facet. 5) Engage your Tribe - Related to his key point that social media is relational, this section offers lots of help in how to participate in conversation with your platform community. He likens publishing a blog post to hosting a dinner party. The host takes care of the location and provides the meal, but the life of the party comes in the ensuing conversations. This is where I hope Believing-Thomas is headed. I know that will take time and interesting content. Lord have mercy. For more information, checking out Hyatt's blog is a great place to begin. I highly recommend signing up for his e-mail subscription. This book is also well-worth the price, whether you are in business, ministry, or other endeavors. For you, what topics cut through the social media noise and grab your attention? Leave a comment below!